My dad told us that we can’t leave the valley. As long as we stay here we’d be protected. (SPOILERS) This adaptation of the posthumously published Robert C O’Brien novel (he was also author of the classic Mrs. Frisby and the Rats of NIMH) has likely had devotees up in arms, since it veers significantly from the source material (there’s always a 1984 BBC Play for Today for those adherents to fidelity). Rather than a tale of a man and a young woman – a scientist and a person of faith, and the underlying ructions that causes – Z for Zachariah becomes a post-apocalypse-a-trois, as a potential Eden is rudely disturbed by an interloper. Of course, the Eden was only really an Eden when Ann (Margot Robbie) was there alone in it, making her the Adam of the story. Okay, she was experiencing hardships (she barely survived the previous winter), but her radiation-free idyll, safe from sickness and disease, was tranquil and unsullied. It’s only when man arrives, in the form of John Loomis (Chiwetel Ejiofor), a scientist lacking her belief system and keen to reintroduce the articles of modern civilisation (mostly in the form of restoring power, which over-symbolically entails the dismantling of Ann’s beloved church) that the fall from grace begins. We see Loomis as a man burdened by his experiences “out there”, prone to aggression and withdrawal, part and parcel of an underlying sensitivity, and his capacity for suspicion and paranoia is only accentuated when Caleb (Chris Pine) arrives, the snake in the garden, professing to have taken shelter in a mine when the event occurred (Loomis was in an underground research facility, where he had been developing a protective suit). While Caleb professes to Ann’s viewpoint (“us believers”), it’s evident he’s disposed towards using it as a lever to highlight the differences between Ann and Loomis. As such, while there’s an element of the novel’s faith vs science, it becomes more about the machinations that occur when men vie for a woman, and their essential untrustworthiness in that regard. Director Craig Zobel (who helmed the standout International Assassin for Season Two of The Leftovers) and screenwriter Nissar Modi emphasise the dubiousness of Loomis and Caleb throughout, in contrast to guileless, open Ann. In the novel, Loomis turns full psycho, but here he’s a more restrained, troubled figure; early on, we see him looking through a gunsight at Ann. This has a perfectly reasonable explanation, but it functions as a signpost for the unsettling undercurrents throughout; most alarming is a scene where he becomes drunk and aggressive towards her. But it’s the alpha behaviour once Caleb arrives, be it the latter training a gun on Loomis ever so briefly, or Loomis’ alternating keenness to have shot of him with recognition of his value, that establishes there is to be no happy ending, or even a lasting mutual truce. Most resonant is a dinner scene, testifying to the corruption both have brought with them, in which they recount experiences in the outside world. Loomis details his encounter with a 13-year old boy, whom he later admits he killed and is fairly sure was Ann’s brother, while Caleb details a fight in the mine during which he looked the victor levelly in the eyes as he was about to turn on him, and the former backed down. These tales inform the most controversial aspect of the picture, the undefined fate of Caleb. Speculation on whether Loomis pushed him into the radioactive lake or he did indeed leave, as Loomis said, is unlikely to be resolved (purely because the makers clearly intended such doubt to remain), but it’s evident that Loomis is capable of murder, and it’s also evident that Caleb was in a situation of giving his potential killer that look. There are certainly logical questions about how Loomis would retrieve and dispose of Caleb’s body (not to mention it potentially damaging the wheel as it fell), but the final scene suggests an arid, mutual acceptance of the lies and distance between Ann and Loomis, now alone once more; she with her organ, her remnant from the chapel, and he having got his power running. And that’s not mentioning the suggestive shot of Loomis, high on the cliff edge, contemplating whatever he may have done. Against that is the possibility that Caleb could see the futility of their power struggle (despite having won Ann’s affections and bedded her) and voluntarily departed, but would Loomis really allow him the suit (he’ll have to stash it, if not)? Loomis tells Caleb he was never a threat, but his defensive words are really indicating what a very real threat he is (likewise his rebuke of Ann; “You all be white people together”). And Loomis’ calculated responses (he sees Caleb’s value purely in terms of his physical contribution to the farm) suggest his profession of love for Ann is not so much about true, deep feelings as a need for possession and claim. Loomis may have won, but there’s no joy to be found in paradise. The leads deliver fine performances, gauged as much on nuance and implication as words. The film is very much a slow-burn, and so may not be to some tastes. As such, it’s rather different to the explicitly survivalist turn and more acutely downbeat ending of the novel. Zobel commented that the softening was intentional; “The book is very black and white about certain things… But I felt it would be more fun to leave it more gray”. Mostly, Zobel achieves what he’s setting out for. 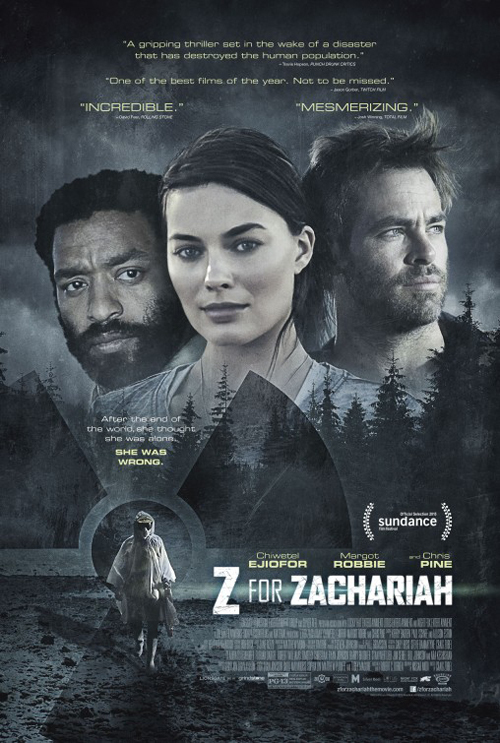 It might be suggested that Ann’s innocence is a drawback in terms of this pursuit of depth, since she becomes the hallowed character squabbled over by untrustworthy men, but Z for Zachariah generally rewards patience with its layered and insightful character study.